Posted on October 3, 2017 February 3, 2018 by Heather Dukes-Murray, Ph.D. It feels like school just started! But the homework battles and mounds of papers on my kitchen counter tell me that school is fully underway, and we are already nearing the end of the first quarter. Whether the school year has been calm or hectic for you, it is about to kick into high gear with report cards, progress reports, and parent-teacher conferences right around the corner. These conferences are a great chance to talk, uninterrupted, with your child’s teacher about your child’s educational progress. It can be a daunting meeting, so below are some tips to help you take advantage of the time and develop a better understanding of how your child performs in school, both academically and socially. Be on time (if not 5 minutes early) and have your written notes and questions ready. The teacher has set aside a chunk of time for you, and you do not want to spend the first 5 minutes of it wandering the halls looking for their room. Also, if you are feeling anxious about the meeting, getting to the classroom a couple of minutes early will give you time to take a deep breath, organize your thoughts, and review your notes. 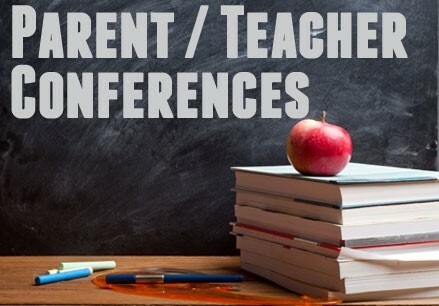 Since there is an allotted amount of time for each parent, there can be a pressured feeling to parent-teacher conferences. Take control of your time and refer to your notes. How does my child do socially? How does he behave during social times in the classroom? What are some strengths my child demonstrates? What are some areas for improvement? What support can I provide at home to help my child achieve? If you have any areas of concern, share those with the teacher. If there is something happening at home that would help the teacher understand your child, be sure to share that as well. If the teacher identifies an area in which your child needs assistance, work with the teacher to identify actionable next steps, who will be responsible for those steps, and time frames to complete. Write it down. Steps could include setting up tutoring services; requesting an evaluation; or simply working out a plan for your older child stay after school to complete work in a homework room. But the point is: if a problem is identified, create an action plan with steps for completion. If you and your child’s teacher develop a plan or identify an area to work on, follow through on your part and keep an open line of communication with the teacher. It really does take a village to raise a child. Teachers provide significant support to our children throughout their development. Hopefully your child’s teacher is a strong person in your village. Keeping this village perspective in the back of your mind may help you turn a difficult conversation into a productive one, where you are working together to develop a plan to help your child reach their academic goals. During the meeting, use strong interpersonal skills, such as active listening, and keep the focus on your child’s education to continue to foster a healthy village for your child. Posted in Academic Services, Articles, Parenting, School and Homework, School-Aged Children, Teens.